Chairman O’Toole. Director Cotton. Commissioners. As many of you are new to the Board, I will review why the George Washington Bridge paths are important, elements of why the Port Authority’s Plan is inadequate and what you can do to fix it. At stake are enhancements to tourism, public health, property tax revenues, sustainability and resilience annually worth hundreds of millions of dollars. The GWB is the sole bike-able crossing between New York City and North Jersey. 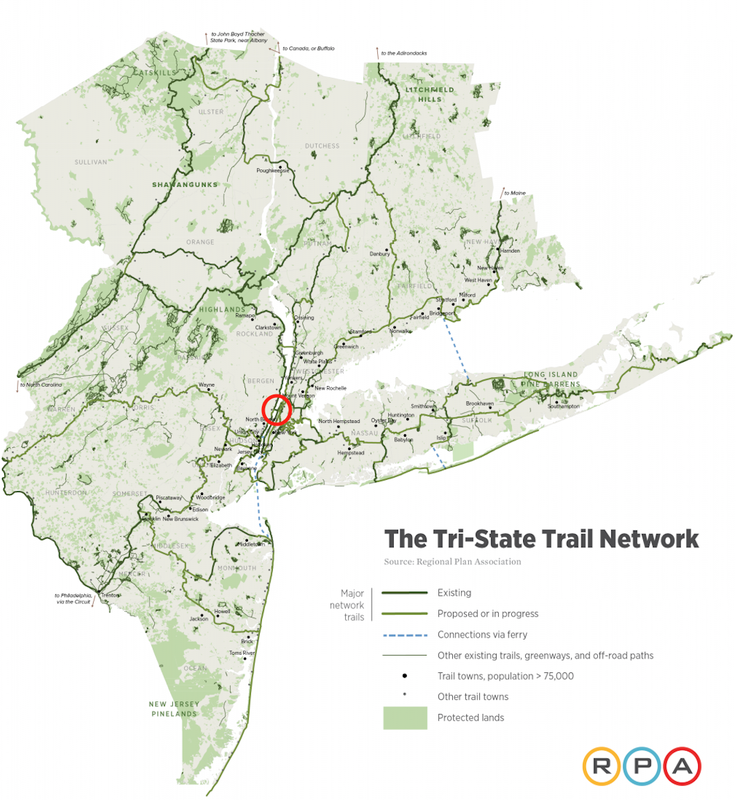 It is also the nexus of the 1650-mile Tri-State Trail Network. Much has transpired since the Agency’s hatched its GWB plan in 2013 – without prior public disclosure, let alone input. This is remarkable. By contrast, the NY State Thruway Authority has posted online numerous iterations of alternate plans for the bike path on the Mario Cuomo Bridge and hosted dozens of public meetings. Now that specifics the GWB paths are known, 180 organizations, businesses, communities and public officials representing millions of residents have called for a design that supports high current and future traffic volume and that meets the needs of all user groups. Critically, the PA Board approved without performing a traffic count – a fundamental prerequisite to the design of any transportation facility. We now know that weekend use of 600 users per hour is double the threshold for widening to 14 foot. And that bike trips have been growing 10.4% per year, which is unheard of for a failed facility – one which cyclists would avoid if had any alternative. And for good reason. Between 2010 and 2016, the Port Authority Police Department filed 39 reports of collisions involving cyclists on or near GWB paths. No other PA transportation facility poses the risk of bodily injury in the normal course of use. It will get worse once the paths are restored. Whatever incremental capacity is gained, by segregating pedestrians from bicyclists on separate paths, will be overwhelmed by growing demand. And the PA’s plan to add “gathering places” to the entrance of each approach pose new threats to user safety. Proposed NY and NJ North entrances. Images PANYNJ. On the New York side, these “gathering places” will be located at the bottom of graded ramps, which cyclists will naturally descend at speed to exit and have to accelerate to enter. In New Jersey, cyclists traveling south down Hudson Terrace will need to make fast left turns against oncoming traffic to access the Bridge. In both places, cyclists will be forced into areas where crowds have now been encouraged to form. The PA will no option but to require cyclists to dismount and walk, in turn creating bottlenecks and traffic jams along the entire span. Manhattan Bridge on Bike to Work Day. Photo by Robert Wright, aka Invisible Man. It doesn’t have to be this way. You can change this flawed plan before it’s too late. Widen the main spans to national standards and dispense with the gathering areas to ensure a safe, orderly flow across the length of the facility. Current NY South path feeds cyclists directly onto connected paths. Image Daniel Panzer. This would satisfy federal mandates to grow biking and walking, insulate the Agency from liability, strengthen the linchpin of regional cycling and add new trans-Hudson capacity that will be crucial should we lose a Hudson rail tunnel. This Agency is already acting decisively to stem the flood of GWB suicide attempts by building a new fence. But why stop there? Why not apply the same urgency to protect the safety of all path users? I urge you to not waste the historic opportunity afforded by the recabling and to fix the Agency’s plan for the paths. Do it now. Do it right. And please find a way to integrate the permanent safety fencing so that doesn’t ruin the view for the generations to come. Thank you. While separating pedestrians from bicyclists normally would improve the level of service (“LOS”), pedestrians comprise just 25% of current peak period travel. By 2024, if trends continue, the growth in bike trips will erase any improvement. The LOS grading for the PA’s plan in 2024 remains “F/Failing”. Renderings PANYNJ and Joseph Lertola.